Don’t you love it when asparagus starts to go on sale in the spring? Here are Twenty Favorite Low-Carb Asparagus Recipes, plus more asparagus recipes from my friends! Check Recipe Round-Ups to find more low-carb round-ups like this. Click here to PIN this collection of Favorite Low-Carb Asparagus Recipes! I’m starting to see more and more asparagus in the markets, and asparagus has been on the menu more often than usual at my house lately for sure. It’s a treat I look forward to every spring, and when it’s fresh asparagus season I think asparagus might be the perfect low-carb food! And there are so many amazing low-carb asparagus recipes! I know I’m not the only one who feels this asparagus love every year, and last week I shared Low-Carb Sheet Pan Meals with Asparagus. 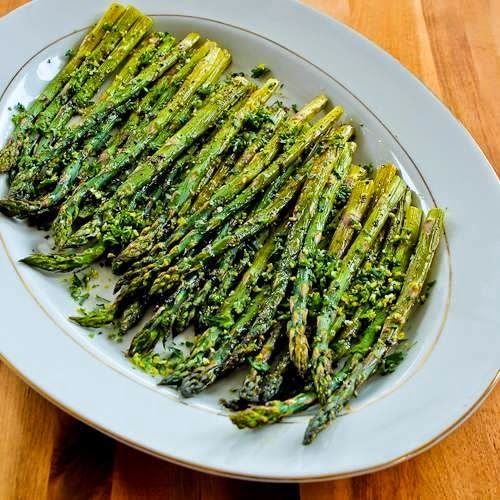 But there are so many low-carb asparagus recipes on this site that are favorites of mine, and it seemed like this week’s edition of Low-Carb Recipe Love would be a good time to update my collection of Favorite Low-Carb Asparagus Recipes! Some of these are things I make over and over every year in the spring, hope you enjoy! Easter Breakfast Casserole with Asparagus and Artichoke Hearts; this is one of my favorite breakfast recipes with asparagus; perfect for Easter brunch! Chicken with Asparagus and Three Cheeses; an old favorite and this is so good! 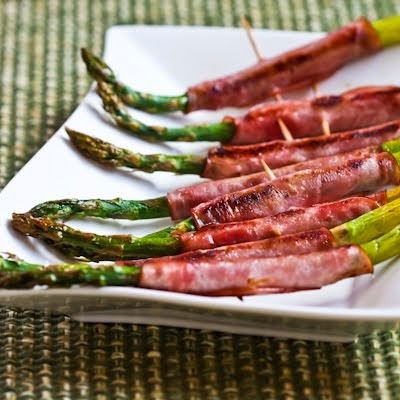 Roasted Asparagus Wrapped in Ham; this is a great low-carb appetizer or buffet dish for Easter. You can use pesto to make the basil vinaigrette if you don’t have fresh basil for this Barely Steamed Asparagus with Basil Vinaigrette. 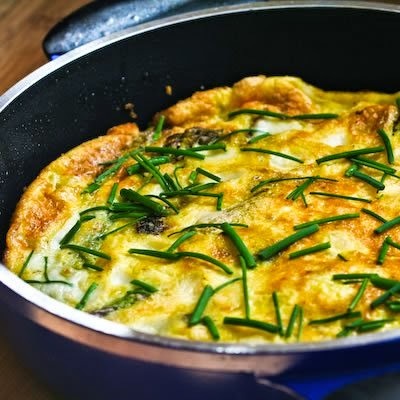 Asparagus and Fresh Mozzarella Frittata with Parmesan and Chives; this is another great idea for brunch. We swooned over this Low-Carb Chicken and Asparagus Bake with Creamy Cheesy Curry Sauce! Slow Roasted Asparagus is something I’ve been making for years. This can share the oven with a main dish, which makes it a handy way to cook asparagus. Roasted Lemon Salmon and Asparagus Sheet Pan Meal; an easy and delicious dinner that’s Low-Carb and Paleo! 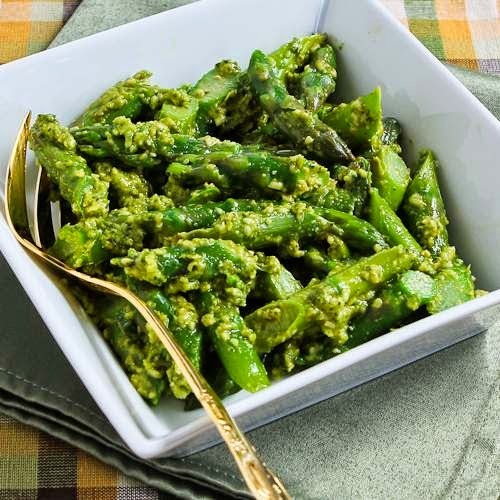 Barely-Cooked Asparagus with Basil Pesto; it doesn’t get much better than this for flavorful asparagus! Use Kirkland Basil Pesto if you don’t have any in the freezer. Crustless Breakfast Tarts with Asparagus and Goat Cheese are always a treat and this is another great idea for Easter! Pan-Fried Asparagus Tips with Lemon Juice and Lemon Zest; I love asparagus with lemon! Roasted Asparagus with Creamy Tahini-Peanut Dipping Sauce; this is such a great combination of flavors. I love the melted goat cheese in this Low-Carb Breakfast Casserole with Asparagus, Mushrooms, and Goat Cheese! Barely-Cooked Asparagus with Lemon Mustard Vinaigrette; I could eat this over and over! Roasted Salmon and Asparagus Salad with Mustard Vinaigrette; the mustard dressing is fantastic on the salmon and asparagus. Easy and Amazing Roasted Asparagus with Gremolata; if you haven’t tried Gremolata, you must try it! Asparagus and Tomato Frittata with Havarti and Dill is great for brunch or lunch. Leftover asparagus might be rare, but if you get some make this Salad with Asparagus, Cherry Tomatoes, Kalamata Olives, and Feta. Grilled Asparagus with Parmesan; this is completely delicious! Baked Eggs and Asparagus with Parmesan; this is amazing and it’s been super popular on the blog! 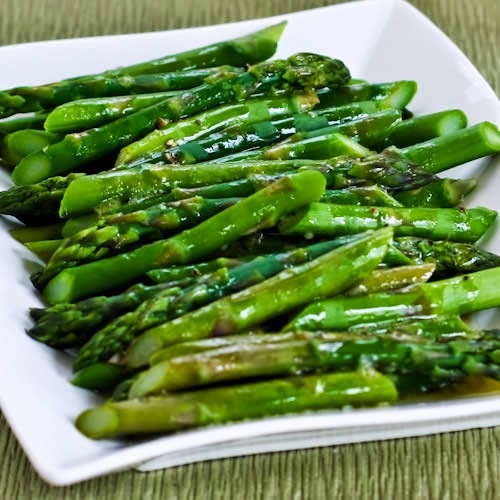 —Healthy Seasonal Recipes has 35 Healthy Asparagus Recipes for Spring. —20 Ideas, Tips, and Recipes for Asparagus from The Kitchn. —30 Asparagus, Artichoke, and Arugula Recipes from Nosh on It. —Asparagus Recipes Round-Up from Running to the Kitchen has some great ideas. —Ideas for Spring on Oh My Veggies has some drool-worthy vegetarian asparagus recipes. What’s your favorite way to cook asparagus? Tell us about it in the comments please! thank you so much for this beautiful list, love asparagus and so will love to cycle through all of these! Sabrina, so glad you like it. Hope you find some favorites! I'm so ready for asparagus season! I think asparagus cooked on the grill, or baked with eggs, are my favorite ways to serve them. Lydia, I have been buying some every time I go to the store and aren't tired of it yet! Thanks Vijay, and happy to include you! Thanks so much for including a link to our post Kalyn! These other asparagus recipes look great! Kiersten, I am so much better, thanks! I agree, love spring foods. My pleasure to feature your great post. I hope you're feeling better now! I think I spend all winter looking forward to asparagus season and now that it's here, I can't get enough of it. I love this round-up–thanks for the link to my spring post! Colleen, so glad you like it! I love asparagus! Thanks for this post. I'm definitely going to make the breakfast casserole ASAP. Thanks Bec, so glad you like it! This is some SERIOUS asparagus love, Kalyn! LOVE it! Lydia, I am so much better, thanks! Betsy, I have never cooked white asparagus, but I think most any asparagus recipe can be made wither either white or green. You could also look in Food Blog Search. Katie, those are some of my favorite flavors too! Sam, will have to go check out your recipes; you always have such good ideas. I would be hard pressed to chose my favorite among these. We love asparagus and I always do an asparagus medley for my Easter post and this year was no exception. I can't think of a more versatile vegetable. My favorite way to prepare it is to poach it and serve it with a variety of different vinaigrettes. I am in love with the asparagus salad with kalamata olives, tomatoes and feta recipe. That is 100% my cup of tea. Pinned! Thanks for sharing a link to my round-up too Kalyn! So many great ideas out there. I'd love to find some recipes for white asparagus! Do you know of any? It's true, it's true — you can never have too many asparagus recipes! Thanks for the links to mine. I'm glad you're feeling better. Food poisoning is no fun. Thanks Jeanette. I am on the mend at last! Loving the asparagus here as well! Kalyn – so sorry to hear about your food poisoning – hope you're feeling better. In the meanwhile, loving all your asparagus recipes – I've been enjoying all the fresh Spring asparagus. Oh man, where to start? It all looks fabulous Kalyn!